Ahhhhhh autumn! My absolute FAVORITE time of year!! I love being able to throw on a comfy pair of jeans, a cozy sweater with a matching scarf and my favorite pair of leather boots and head out to enjoy the crisp outdoors. Mother nature showcases her finest work with rolling hills filled with colors of red, yellow and orange. The once overgrown fields take on a beautiful burnt yellow hue and homes nearby display bright pots of mums, pumpkins and Indian corn. 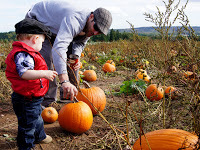 To celebrate autumn this year we decided to visit a pumpkin patch to pick out a fresh pumpkin. This has been on my “list” for a long time. I’m exc ited that we can start to establish some family traditions now and this will definitely be one of them. 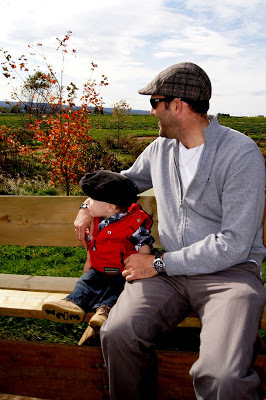 We found a spot only 25 minutes outside Moncton that offers blueberry and apple picking as well as a pumpkin patch. Perhaps next year we will add a separate apple picking trip to our fall traditions. It was on a beautiful plot of land with the Memracook river adding to the spectacular backdrop. It was almost 18 degrees so we were lucky to have such a gorgeous day to spend outdoors. First we took a hayride to the location of the pumpkin patch. Stephen knew exactly what he was looking for and he set out to find it. Meanwhile, Chase and I played among the harvest. There was one other family with us so we traded cameras and captured some family portraits. After a hayride back, this time proudly bearing our chosen pumpkins, we browsed through the market full of produce and preserves. Chase had fun playing amongst the pumpkin people and hay bails and took a tractor for a test drive. Stephen had so much fun, he even talked about keeping our artificial Christmas tree in storage and getting a real one this year to repeat the experience but in the snow!